Olgas is a family-run establishment (since 1994) situated in Yialos, just by the port of Ios, on the ascent to the narrow cobbled streets of Hora (the main town) at the top of the hill. Its location offers long views over the bay (all rooms have private balconies and are arranged around a pristine pool area), and also makes it the perfect base for the attractions of Hora, the bustling port and stunning beaches on offer, as well as the less travelled paths inland, such as the prehistoric site of Skarkos, and the reputed tomb of Homer. Visitors to Olgas will discover a friendly, pleasant and quiet oasis away from the hustle and bustle of the islands club scene. 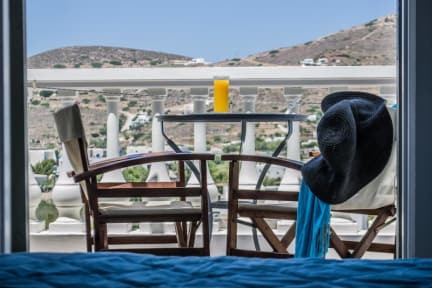 So much so that our guests that return year after year tell us that they value the quiet serene surroundings and relaxed atmosphere: from the breakfast spread in the shade, the pool-side recliners to cool-off in the afternoon, to an early evenings aperitif with a colourful sunset backdrop. In certain spheres, Ios has a reputation as a wild party island - this is definitely not a wild party establishment.